Sitting outdoors on a beautiful summer day is a great way to pass the time. Patios and decks are meant to be enjoyed when the sun is out. But sitting in direct sunlight on hot days is usually ill-advised; a reprieve from the harsh rays is often needed. With completely customizable outdoor shade solutions, we can provide excellent coverage from the sun that is both useful and beautiful to look at. What is Outdoor Tension Shading? A high-quality material that is stretched between a lightweight metal frames is the ideal way to protect certain areas from the elements. Tension shading is often said to resemble a beautiful sail and can be used for a variety of purposes. 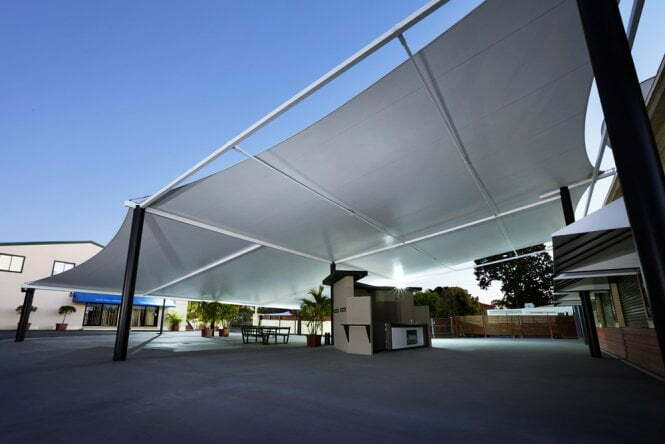 From shading play-areas to patios, parking lots to walkways, outdoor tension shading provides a beautiful canopy for all your shading needs. In many cases, outdoor tension shading is the best option for creating shade. Its lightweight material and durability makes them the preferred choice for many homeowners and commercial buildings. While they are not expensive to erect, the benefits of installing tension shading are great. From their beautiful aesthetic appeal to the fact that the materials used can absorb heat and humidity while offering protection from UV radiation, tension shading offers all the benefits of an outdoor retractable screen. Tension shading is also excellent in cases where a traditional screen will not suffice, for example, in areas where an awning might damage the current structure in place. Its durability makes it an excellent choice in areas with inclement weather since most fabrics used will last about 10-12 years before needing to be replaced. Even at this point, the cost of replacing the fabric is relatively low. One of the key components of tension shading is the tension rod that holds the materials. This tension rod is not currently available in Canada, which means it must be imported to complete the job. This typically works to our client’s advantage since it means they will receive the exact part needed for their shading system. One of the best things about outdoor tension shading is the customization factor. We can provide unique solutions for your specific shading needs. Whether it’s a large area that needs to be shaded or a small patio, the options for tension shading are endless. As the only Canadian provider of outdoor tension shading, we are in the unique position to offer clients a wide range of choices. With local options for these shading systems limited, we are able to import materials and necessary parts to create a shading solution that is specific to your needs. Whether you are looking to create shade for a patio, deck, walkway, play area or parking lot, an outdoor tension shade system may be exactly what you are looking for. At affordable prices and a five-year warranty, our outdoor tension shades can provide the protection you need. Call us today and ask about our customizable shade solutions.